I have always been convinced that ignorance of the phenomena has led to its status as a “mystery.” In other words, if more people were aware of them, someone smarter and more curious than I am might finally explain it all! Perhaps you can help. I remember noticing those in WorldWind with the topo maps, and in all the reading I have come across.. no one has looked too deeply into the geologic structure under them to see if they are all just related to sink holes. I don’t buy into the impact theory.. the patter in all wrong for a large object breaking into smaller ones (it should look like a shotgun blast then, not a line). Thanks for the post Stefan! Chad, I appreciate your interest. Take a look at Figure 2 in my essay. It shows the radial nature of the long axis of bays as you move northward or southerly along the Atlantic Coastal Plain. The pattern is clearly “shotgun blast,” not linear. Whatcha think? I think it is pretty safe to say that these depressions are not extraterrestrial in origin. Remember, there are many ways to produce circular depressions, and meteor impacts are very rare. Am I the only one who thinks Hudson Bay is the remnants of an impact? Also, meteor impacts are not as rare as you think the occur on a daily basis, quite actually. I don’t think each of these depressions was the result of individual impacts, but rather overspray from one impact. I suppose a belief that Carolina Bays were the result of an extra terrestrial impact is as justifiable as a a larger cultural belief that we are all going to die of global warming. Largely a result of misinformation provided to an under educated culture this theory is yet another example of the dangers of misinformation, assumptions, and fear in our flat world. Mr. Howard, I am of the opinion that you’re searching for something you’ll never understand for certain and that would not provide you any satisfaction if you did. Your curiosity is similar to that of a child searching for Santa Claus, something that when finally found turns out to be a lie and let down. Someone smarter and more curious just might realize that they are wasting their time and instead invest their energies into something of actual benefit to society. It is much more likely that my great grandfather, A. R. Dugmore was correct in theorizing that the bays were a result of giant prehistoric beaver ponds. Simply a topographic remnant of our world before we had the largest impact upon it. Arthur, did your grandfather publish his idea of Carolina Bay formation? The reason I ask is that I’ve contended beaver involvement (including Giant Beaver) since the early 1990s but have never seen any mention of this possibility in earlier Carolina Bay literature. I do think that an impact event provided the alignment and regular shape to these features via steam explosion, as in volcanic maars, but I actually use excerpts from your grandfathers excellent work —The Romance of the Beaver— to show how beaver activity can explain some of the odd aspects as well as the distribution of Carolina Bays. As for evidence of an impact event capable of affecting shallow ponds in this manner; it is growing quite rapidly and recently research along this line has produced the youngest remains of (Castoroides ohioensis) Giant Beaver yet found. Ken Tankersley found this material in the burnt layer beneath the black mat at Sheridan Cave, OH. This layer, which dates to 12,900 CalYBP, is proving to be common in the northern hemisphere and contains exotic materials diagnostic of an impact event. With regard to your condescending comment on Mr. Howard searching for Santa Claus; a correct assessment would be that Mr. Howard as well as myself are trying to determine via scientific investigation whether the Carolina Bays could be seen as Lucifer’s footprints, for if they are indeed impact related features they most likely do mark the event that gave rise to that fallen angel, evil serpent, genre of myth. I don’t believe the bays to be impact craters. I think more possible they are made by material of the earth, thrown out by an impact somewhere else. That’s why they got not all the same axis. I have been leveraging GE in my attempt to triangulate the orientations of the various Carolina bay structures in North America. A good starter overview kml file for you to reference would be the Web Plug in Summary file that I am using in an embedded viewer on one of my web pages ( HERE ). The kml file has placemarks with annotations that function as an index to the ~170 “fields” of bays being researched. This was done to minimize the memory hit from the collection of LiDAR images being used. Each placemark’s pop-up presents a small jpg of the LiDAR image, and has a link to the actual LiDAR data as a network-linked kmz file. The LiDAR imagery was created in Global Mapper, using their KML generation output feature, and typically contains several levels of increasingly-higher resolution imagery, revealed as the user zooms in. They are big, seveal as large as 10 MB. Also included in each field’s specific kml file ( available from the pop-up) are path elements as “trajectories” describing predicted bay orientations, and walk-back triangulation suggestions. Overlays are included to highlight bay geometries and to aid the user in selecting his or her interpretation of the bays’ orientations in that region. The “bearing Grid” overlay can be rotated to suit your view of the orientation and the copy/pasted into my on-line java kml calculator to generate updated trajectory predictions. 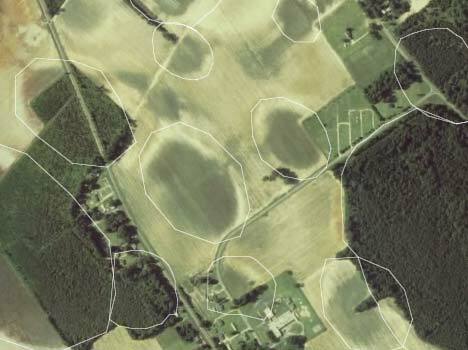 The calculator can also be used to generate orientation predictions using a placemark created by a user in the center of a previously-identified Carolina bay.